This PRS is full of surprises, not least that you can find one for less than £700 - and that it's a signature model that anyone could pick up and make it their own. Excellent build quality. Signature branding doesn't go over the top. Superb performance for high-gain riffs. 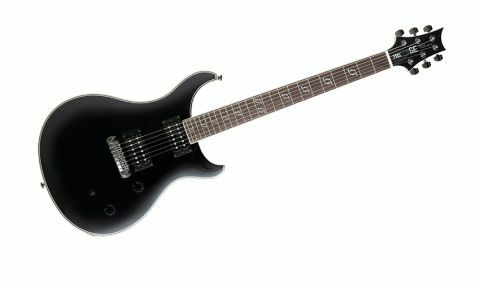 The black finish may deter traditional PRS fans. Clint Lowery isn't the most high-profile metal guitarist to have a signature guitar. Lowery and his band, Sevendust, aren't too well known over here, but he's a man who knows his guitars, and this signature PRS SE is a bold piece of engineering that broadcasts its intent with its looks and spec. "A double-cutaway electric, sawn from a solid slab of mahogany, the Lowery is tailor-made for meaty down-tuned metal riffs"
A double-cutaway electric, sawn from a solid slab of mahogany, the Lowery is tailor-made for meaty down-tuned metal riffs. It's even shipped in drop B tuning, and to accommodate the lower frequencies, the guitar has a Fender-esque 648mm (25.5-inch) scale - a half-inch longer than the PRS norm but some way short of the 704mm (27.7-inch) monster scale of the PRS SE Mike Mushok Baritone - and comes fitted with a set of custom-gauge strings (0.011 to 0.056). The build quality and silhouette is classic PRS, but while the Paul Reed Smith showroom is wall-to-wall flame maple and avian inlays, Lowery's SE favours an all-black finish, complemented by white binding on neck, body and headstock. Yes, the big man's signature graces the headstock and the Sevendust logo marks the frets, yet Lowery's guitar looks and feels like an instrument that could be appropriated by anyone predisposed towards rock and metal - a lighter set of strings and a quick setup could easily put the Lowery back to concert pitch if down-tuning isn't in your playbook. As good as it looks, the most exciting thing about it is its performance. Sonically, it had one prerequisite: high-gain riffs in lower registers had to sound great. We found the guitar had that and a whole lot more. Similarly priced metal-leaning electrics tend to opt for a set of EMGs, or another similarly active pickup configuration. On occasion, they have the power but lack a little character. Here, we have PRS's SE HFS and SE Vintage Bass humbuckers, fitted in the bridge and neck positions respectively; both are passive, but they have enough grunt to articulate the sort of sonic rough and tumble that is Lowery's stock-in-trade. Moreover, there's a warmth to the Lowery's lead and rhythm tones that many of its competitors don't share. Any worries that the guitar might sound a little dull and woolly were unfounded. Sure, mahogany will always make for warm and thick rather than super-bright, but there's plenty of sustain, and more than enough harmonic response for those who sauce their playing with pinched squeals and natural harmonics. There's even a pull/push coil- split on the master tone knob, so you can dial some more subtlety and range into your tone, and the Lowery has a soulful, bluesy voice when you roll back the gain. Indeed, this PRS is full of surprises, not least that you can find one for less than £700 - and that it's a signature model that anyone could pick up and make it their own.